Beyond the Amazon River, up the Ucayali and Tapiche tributaries, the Tapiche Reserve is a wild destination largely unknown to outsiders. Located 404km upriver from Iquitos in northern Peru, our 6000 hectare property invites you to leave the chaos and clutter of civilization far behind. "Going on the boat towards the reserve felt like being on the way to freedom...disconnecting from all the things we don't need and at the same time (re)connecting to nature." 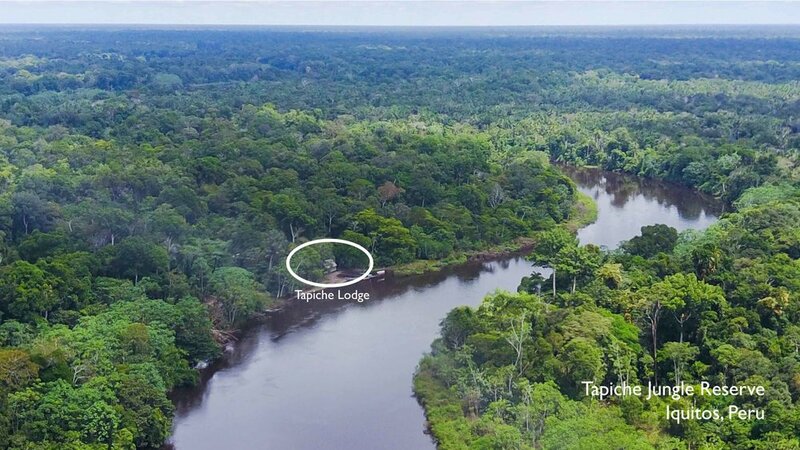 The Tapiche Reserve is located several hundred kilometres from Iquitos in forest which has not been exploited. Getting to Tapiche thus involves a long fast boat ride- lots of fun in and of itself, but also a way to observe the changing patterns of the forest between Iquitos and Tapiche, as well as a load of wildlife along the way. The journey from Iquitos, Peru to the Tapiche Jungle Reserve takes approximately 12 hours from door to door, including rest and meal breaks, transportation transfers, and possibly some wildlife watching as we progress deeper into the forest. This is a general estimate, so please understand that actual travel time during your trip may vary. The journey is a unique opportunity for visitors to observe firsthand the impact of humans on the rainforest. It also helps guests understand the pace of river life and the transportation and logistical challenges that local people face every day. The forest closer to civilization is short and thin, and in some areas it has been completely cleared for agriculture or livestock. We stop for lunch halfway between Iquitos and the lodge in Requena, the largest town in the area. Requena is the hub of wood laundering operations and a funneling point for all other products coming out of the jungle, from plant products to jungle animals. This is a rare glimpse into the lives of real river residents going about their daily lives, no costumes or show performances here. As we continue navigating up the winding network of glassy blackwater rivers, villages become sparser, trees become taller and thicker, and birds and pink and grey dolphins greet us as we pass. If reptiles and land mammals reveal themselves, we stop the boat to properly appreciate them. When the river narrows and the trees form vibrant green walls hugging the winding Tapiche River, we have arrived at the Tapiche Reserve. Contact us to begin booking your jungle adventure.